For a few reasons, going to Glastonbury and starting a new job mainly I haven't yet written a review of the Dell Streak that I purchased nearly a month ago now! So here it is...if you don't know already the Streak (also known as Mini 5 before it was released) is a 5" Android device. I say device becasue it is not immediately apparent what to call it. It's a bit big for a smartphone although it can be used as a phone and a bit small for a Tablet. Certainly it looks really small compared to an iPad and huge compared to an iPhone or even a Desire. A few more things about the form factor, the device is (unlike the iPad) a true widescreen format and whilst it can be used in portrait or landscape is really designed for landscape. In fact the Home screen is locked in landscape. The screen resolution is 800x480 which is the maximum Android can currently support. This is the same as other high end devices but the huge 5 inch screen really makes the difference. I bought my Streak as a data only device and have't used it as a phone I am going to concentrate the review on what I have found the device useful for and what it isn't so good for. I really like the Streak but I don't think it is the kind of device (like say the iPhone, MiFi or even the iPad) that I would suggest would be useful for lots of people. I think it is going to appeal to and be useful to certain groups of users - certainly techies but also for some productivity applications that I will discuss below. As with all mobile smart devices, phones and tablets it is the apps that really make the device so I will discuss apps I have tried and used and how well they work on the Streak format. The Streak runs Android 1.6 which is (in Android terms) quite an old version. The latest versions 2.1/2.2 do have some improvements that are missing on the Streak - for example multiple Google account support and native Exchange sync but otherwise most things are similar and most apps run fine - a few notably the "official" Twitter app don't. Dell "promise" an upgrade to 2.2 at some point but Android updates always seem to take forever which is realted to how much the OS is customised. In the case of the Streak this is quite a bit. 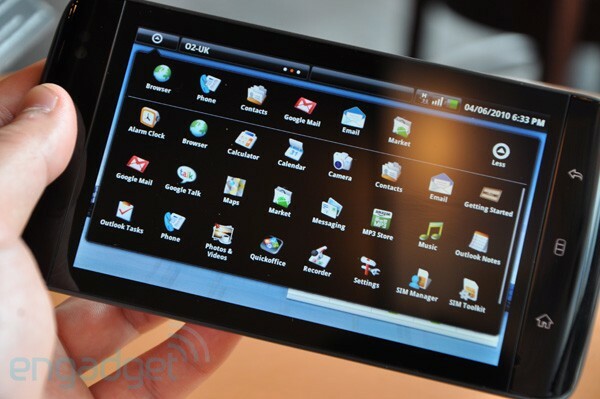 The changes Dell have made to the base Android UI are generally very good and make the device very useable. They have added more "menus" across the top of the device including what is basically a start menu, a permanent area for notifications and a signal display whith a pull down menu that lets you turn wifi, bluetooth etc on and off really easily. There are three home screens but you can easily add more and the vast screen gives lots of space for widgets. The UI even allows for folders in a very iOS4 like way that you can add shortcuts to. There are built in Facebook and Twitter widgets. I kept the Facebook one which shows status updates and links to the web version of Facebook (see browser below) but installed a replacement Twitter app Touiteur which works incredibly well on the Streak and has a nice scrolling widget. The Home screen is as I mentioned locked in Landscape although the Menu system does work in portrait (as do many apps). This doesn't bother me as I tend to use the device in Landscape but some users seem to find it irritating. One thing I didn't like is the keyboard. At first glance it looks good with a keypad to the right of the regular keyboard but this wastes space and it isn't easy to type on. In fact I found it worse than the iphone which is a shame on such a large device. However, being Android you don't have to stick to what Dell ship and I tried "Better Keyboard" (which was an improvement) before stumbling on a beta of Swype which is amazing. You really have to see Swype to beleive it and it works brillianly on the Streak and even if you don't "swype" the regular keyboard it has it much much better than the Dell one. The usual webkit browser is included and there is nothing remarkable about the browser itself, it is the usual decent Android experience. What really does make the difference is that in landscape you can pretty much browse normal web pages without having to zoom in and out. It is the smallest device to give a true desktop experience. This means that I have't bothered for example to install the Android Facebook app as you can use the regular website. The device is great for browsing with two small problems that should be easy for Dell to address. Firstly the device identifies itself as a phone and you end up with the mobile versions of many websites (such as Facebook or BBC News) which is a waste. There is a "hack" available but this doesn't work for all sites. The other issue is the lack of Flash. Both these issues should be solved by 2.2 and even with these issues browsing is a joy on the Streak and definately good enough to use it in preference to a laptop for casual browsing when you don't need to type much. You can always install the Skyfire browser which lets you view Flash video. The Streak comes with a cut down version of Quickoffice which lets you view Word, Excel and PDF files. This can be upgraded fora fee to the full version that not only allows editing of these files but also has an excellent file manager that not only shows you files on the device (and its SD Card) but also Dropbox and Google Docs. This is handy as the native dropbox app doesn't work properly on the Streak but this does. The other choice for office docs is Documents To Go which doesn't have as good a file manager (no external cloud links) but does seem to render many office documents better and faster. Neither is that expensive and you can always use the 24 hour refund policy of the apps store to work out which suits best. Guardian Anytime is one of my all time favourtite Android apps fetching a locally cached copy of The Guardian down to your device overnight complete with pictures. It looks even better on the Streak with its big screen. There are a few eBook reader apps and Kindle for Android has just launched. Although not using "eink" the Streak is a reasonable eBook reader although you would probably not purchase this if this was your primary use. The Streak screen is ideal for video and just the "right" size if held in your hand. Built in support for formats is OK but you can get many more by downloading "Rocket Player" from the Market which gives a wide range of format support. You Tube videos look great. Of course you can buy extra cables and there is a good selection of Dell accessories that seem reasonable quality. They are however really expensive, yes £24 for just a sync cable (owch). They have also been slow to ship. Hopefully third party accessories will arrive and help to push the price down. Standard headphones (including those with microphones and remote controls) work fine in the Streak although I found the sound generally OK but disappointing through the speaker. The Dell Streak is a genuinely innovative and different device. Big enough to read books and office docs but small enough to put in your pocket. The dilema with the device is that unless you want to use it as a phone (which it is a little big for) then you will have to end the search for the holy grail of once device and carry the Streak and a phone as well. I don't think the Streak is going to suit everyone a smartphone or iPad will be better for many users but it is well worth a serious look.